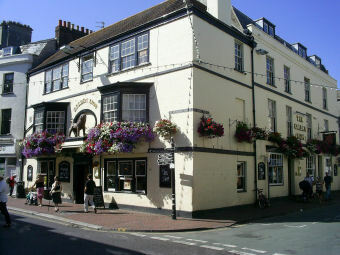 After trudging around Weymouth for 40 mins trying to find a pub that did some interesting food and wasn't part of a chain (and failing miserably), we needed at least a beer, so went into the Golden Lion. Big, "open plan" and lots of wood everywhere, looked like it was probably gutted ten years ago and made to look "old". Reminded me of some of the dubious places I'd worked in during the 1970s, where it's empty much of the time, but occasionally packed with young people at night. Looked like it needed a good lick of paint and a really good clean. Toilets were disgusting (apparently the ladies were too). It was early midweek evening, and only three other customers. Anyway, the barmaid was friendly enough, and I ordered a pint of Greene King IPA for myself, and "scrumpy" for my wife. I took a sip of the ale as I was getting my change and it was like vinegar. She poured me another without question, but that was just the same. I opted for Doom Bar instead, and no probs at all with that. But serious doubts about cellar management. I really do wonder what the Olympic tourists are going to make of Weymouth - it just doesn't seem to be prepared for anything other than "kiss-me-quick, where's the chippy" English holidaymakers. Sorry. Dropped by here for a quick beer or two at Easter. Played pool, good value. Beer was OK to begin with but the second pint of Doom Bar was dead. The Barman went and checked the barrel and changed the beer and only charged half price so gets a tick in the box there. Decor not great and had the atmospere of a struggling pub. I hope it keeps going. Hmmmmmm interesting the last couple of reviews. No previous postings yet such gushing comments. Now I love Weymouth having spent many happy pub crawling days here, but please if your going to review pubs at least have the courage (no pun) to do it honestly. 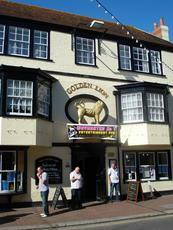 What an amazing turn around the golden lion is under new management !!!!! we visited last week and its clearly the place to be at the moment .... fantastic food great staff who are helpful and friendly the premises has been leaned from head to toe ...makes all the difference from the last management ..!!! well well done and good luck guys its finally working out as a good food great entertainments place welcome to weymouth ...!!!!! !